Author Written by Cleo Isco and last updated on Posted on January 22, 2018 . Posted in Categories SAP Certification FAQ. How to learn SAP for free? It is a good question and everyone who wants to find a job in SAP world should be asking this question before considering any paid training opportunities. The official way of learning SAP is SAP training courses provided by SAP Education (a division of SAP that is responsible for training and certification). However, these courses are quite expensive and not everyone can afford them. 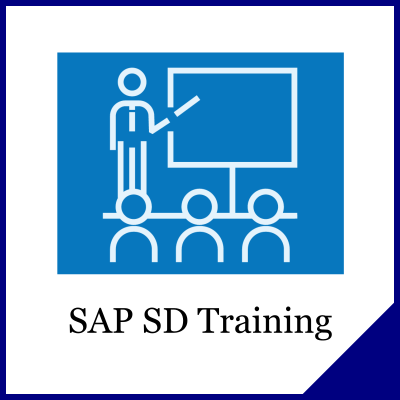 Of course there are cheaper alternatives – non-official SAP training institutes that provide SAP training for smaller price. There are two problems with non-official SAP training providers: (1) they are still expensive, (2) there is a high chance of encountering a fraud institute that provides low quality training. So, if you decided that official training from SAP or from third-party institute is not your thing, than what you should do? How to learn SAP for free? Hmm… Actually, there are many options and we will consider each of them in a separate section. You should understand that since you don’t pay anybody for conducting the training, you need to be really disciplined and determined in organizing the learning process and achieving your goals because there will be no instructor or teacher who could encourage and motivate you. There are a million websites that are focused on SAP. The problem is that it is hard to find a good introduction for people who have zero knowledge of SAP and it is hard to find a coherent introduction where one concept builds on the next (training classes we mentioned in the beginning are better for this purpose). Naturally, the following list of SAP websites is not complete, but at least we strove to include all the most popular. It would be nice to update this list if you guys can write your favorite websites in the comments section. OpenSAP – Open online courses delivered by SAP. The idea of the website is great but it is geared towards experienced SAP professionals that only need to keep up with the latest product updates and new features of SAP program. If you are a complete beginner to SAP, it might be difficult to understand these courses. Although books are not free, comparing to the cost of SAP training, their price is negligible. Moreover, you can use them later on for reference as well. On our website there is special section where good SAP books are collected and reviewed. Although now we only have SAP SD books, SAP FI books and SAP MM books, our collection will be expanding in the near future. Besides theoretical knowledge you also need to practice with real SAP systems. Unfortunately, it is not possible to install SAP on a regular personal computer because this system has high hardware requirements. Also, you need to take care about expensive software licenses. The good news are that you can access SAP remote servers (running SAP IDES) for a monthly fee from a number of companies that offer access to SAP ERP servers with some sample business data. While their services are not free, you for sure can find some money to pay for them (they are not too expensive) and do some practice in realistic SAP environments! You can find our reviews of the companies offering access to SAP servers here: SAP IDES access. We have written a follow-up post about 10 free SAP tutorials available online. They should also be helpful in learning SAP for free. SAP has launched SAP Learning Hub that provides online access to SAP handbooks. It also has free edition. Make sure to check it out in more detail here: Free SAP Training with SAP Learning Hub. 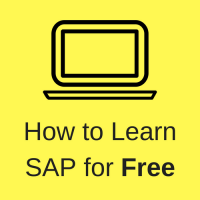 We’ve launched a number of free courses for everybody who would like to learn SAP. If you ever wanted to learn SAP, this is the best time to join our course and study SAP together with us. The links to the free courses are below. I hope that this information will be helpful for you and if you have any questions, you are welcome to ask them at our forum. Unlike comments below, all questions posted on the forum will be answered! Thanks for the post! It is a nice starting point for those interested in learning SAP. SAP/EPR base is forever and very usefull for the enterprises . Go for it and enjoy for rest of the life. Other think is that all MNC company use SAP .if people start his working life with MNC he need to learn the software according to his job profile . HR ,.ACCOUNT , PRODUCTION ,MARKETING ,SALES SERVICES,ETC. I am Preeti Saxena. I have completed my MBA(PG Diploma, from symbiosis) in finance. I heard about SAP and want to know that would it be beneficial to me or not. As my background is not Accounting and I did MBA through distance learning and I worked in BPO n KPO for approx. 4years. But at the time I am not working and looking for new opening. If I will learn SAP, would it be helpful to me as my age is approx.33yrs. And approx. how much salary I can get through SAP. And what would be the starting salary. And from where I should learn it? Please post your question on the timeline of our Facebook page. We will answer it there because this article is about the ways to learn SAP for free. plz tell me more about sap accounting.. If you switch your career to SAP, most of your previous work experience will become irrelevant. And you will have to start from the scratch. It means lower salary and difficulties in finding a job. I am not sure whether learning SAP now is the right career choice for you. This is the best advice I can give based on the little information you provided. sir have a went to sap training..
am completed MBA 2 years Program am doing job. non related to my qualification so please give me suggestion. i have interest to learn SAP. please give advice for me. if you need to change your job age factor never consider because a successful person always learn new thinks . you have a good qualification in a good stream in your stream lot of chance get high salary on high designation my suggestion SAP also help you get good opportunities in a future. so without waist your time take a decision . i am rahul having 2.5 year of experience in finance and accounting just a commerce graduate but i have worked on some modules on user level .i.e.sap-SD and sap-FIas of work profile required .But sap is the field i want make my career into so what efforts it will take. is their any coaching classes i need to take for become expertise in sap ??? The best way to learn SAP is to practice as much as you can. You can also start by taking some SAP training classes but be careful with choosing a training provider. Read reviews first and then decide! You can see our FB page about SAP certification on the right side of this article. Is this possible to switch to SAP. Hello. I am a MBA grad from Canada. I do not have much computer knowledge and do not have any programming knowledge at all. I was looking to learn SAP. I have never used SAP or learned it. Which certification would you recommend I take, I am leaning towards SAP HCM. Can you please help me, telling me if this is a good scope and which certification to take and does it require a lot of computer knowledge? Thank you. In your case, I would first consider SAP training and only then SAP certification. If you never had experience of working with SAP, you definitely need some hands-on practice and learning with a real SAP system. Therefore, you may be interested in SAP Remote Access service. It gives an opportunity to practice with a real SAP system without the necessity to purchase the licence or have powerful hardware. i new for this field ….. i have no experience …. i want know hope for sap in india…. SAP/ERP is the present and future feild. It is highly paid as a consultant as well hourly based job. I will advise you go for it. This subject very hot in western world. Hi, I know Japanese language and im have done my graduation in accounts now im planning to learn SAP FICO. Is it good for me? will it help me to find job in japan? Yes, SAP FI/CO seems like a good option for you if you have some background in accounting. Here you can browse some SAP FI jobs. Am visiting this site for the first time. I find it so helpful and thanks for all the replies to the queries above. Am currently working on the cloud erp suite. basically i want to learn the ERP functionalities in modules SAP SRM or SAP MM. I look to become a functional SAP SRM / MM consultant so kindly suggest me where can i find the configuration documents and also practice it. m just started BS in software engineering..i wonder if learning SAP ‘d at all, be beneficial for me? kindly guide me. And if it does, where to start from? Hi, I am an IT employee, I dont have programming knowledge and dont want to learn programming, Pls. let me know which SAP training will work for me. I need training for SAP..But honestly i cant affort it.can you help me please. I was wondering whether there is a Cloud computing/Virtualization like Module in SAP. I am looking for a IT Infrastructure profile in SAP as i do have experience in Windows 2003, 2008 R2 and Virtualization(certified candidate too). I have heard of BASIS profile but quite doubtful of it. I got my Master in Accounting. What is the best path to learn and get certification in SAP for Accounting. Is there any special way for Cost Accounting? The best way to learn SAP is to take a training course with a real instructor but not everybody can afford it. A more affordable alternative is a book or a video course. please do you need a background in accounting before you can take a course in SAP? No, you do not need accounting background for taking an SAP course. Accounting background is beneficial only for certain SAP modules like FI (financial accounting) or CO (financial controlling). Other modules do not require any knowledge of accounting. Sure! It is a good one! Hello,I am piyush,i want to learn sap,bt i dont know about this,tell me about this how we can learn this,from which website,about completion this without certification, can i get a job,plz do advise. Hi , I have trained in sap abap, can you please post some real time scenarios on some topics and which website has free online training on webdynpro,please reply me. can you please show me step by step for Sap id!. Please have a look here: How to Get SAP S User ID. Hi! I would like to know which online sap courses I could take to enhance my background on SAP. I am an accountant by profession and I am planning to put up my own BPO company. i would like to refresh my knowledge about this software and at the same time learn more. Thanks for notifying us about the broken link! We do not offer SAP IDES access ourselves anymore but we can recommend our partner: Ivobe (http://www.ivobe.com). They have good prices and reliable hardware. I have updated the link in the article. I just need to know if we can get a certificate after the training and is it actually for free? No, of course, you will not get any certificate after free SAP training. You will only get knowledge of SAP and SAP configuration/development skills. No, it is not possible to do SAP certification from home. You always need to go to an authorized certification center. Hi , I did my SAP-ABAP certification .Got one year experience on an implementation project,got an good exposure on core ABAP. I am Rohit. I want to learn SAP MM module. What will be the Cost & Duration? Hello. I am a Employer in Binani CementLTD. I do not have much computer knowledge and do not have any programming knowledge at all. I was looking to learn SAP. I have used SAP or learned it. Which certification would you recommend I take, I am leaning towards SAP HCM. Can you please help me, telling me if this is a good scope and which certification to take and does it require a lot of computer knowledge? Thank you. I’M looking for SAP HR do mine job, but i have to learn free sap course can u suggest the website please ..
Hi, i am blind and working in reputed IT company , i want to learn SAP finance , iis it accessable with JAWS screen reading softwere . Can u suggest some institute in Bangalore for sap bpc & fico course? i want to enroll so i can practice SAP online but i dont have the Visa card.so iam wondring if you can provide me with your baking details so i can depositor transfer the money then send you the payslip? Hi I am very interested to learn SAP BI course. At present, I am a Master’s student but unfortunately I don’t have computer science or management background, But Is it possible for me to settle as business analyst, I already joined for sap training but unfortunately the trainer didn’t teach anything to me because he doesn’t know anything again I cannot join for the course next time because it is expensive so I am learning from you tube channels . Is it possible to get job in sap bi as I don’t have any experience in sap field. Can you please let me know about the costing of modules. I am venkat and willing to learn fico module I did complete MBA finance have good computer knowledge and 2 years of experience in tally good .but now I am learn which modules suitable for me please suggest . I am Bilal Hassan. I am doing my MS In Business Administration. I did M.COM. I want to learn SAP Software. Is it right for me or not. Please guide me. Can you please tell me the cost structure of learning SAP. I am Pursuing CA and I am a CA Final Level Student and know about the opportunities after learning SAP. I have completed B.CA and have 4.7 years exp in finance field. I would like to learn SAP for better career. Please let me know which SAP courses will help me to upgrade my career? Please advise. i am new to sap , just started to work in a company,i have been learning abap for 1 month and they have put me in crm team. i find it really difficult to get good materials to learn from the internet. could you suggest me any books related to ABAP and CRM. SAP PRESS has a ton of great books on ABAP! Getting Started with ABAP helps you learn the basics of ABAP and you’ll write your first program. There are other great books for when you become more advanced. They also have two great titles for CRM. SAP CRM: Technical Principles and Programming and SAP CRM: Business Processes and Configuration. I would check those out. Head to sap-press.com! I am currently working as an end user in SAP MM & PM module. Please suggest me some basic book for MM module before going for certification course. I took the training in SAP back in 1999 from Sapient college (Siemens) Chennai. But couldn’t clear the certification exams. Since SAP demand was very poor at that time I ended up in my are – Oil & Gas sector in Canada. I worked with one of the Oi & gas producers, Suncor Energy(Petro Canada), almost 7 years and used SAP(PS) as an end user. I am basically mechanical engineer but worked as a project manger and now the oil & gas area looks bleak in the long run. I am 44 now, Is it a good idea to revisit SAP for career change. I have in depth experience in business process such as project services, production and material management etc. I have 2 years of experience in Recruiter,basically i am BE(ECE),So i want to coordinate my career with SAP HR.So SAP HR will helpful for me.Plz suggest. I would like to know from your point of view if i would be able to learn finance module (SAP FI) just reading one of the books that you are offering, really would it be a good approach? If you are from hyderabad, and wanted to learn workflow then contact on this number. +91-7075926314. Am parthipan..am from mca ..BT currently am wrkng n SAP end user level with 1 yr exprnce. Kindly suggest me wt I should study n SAP to set my carrier. My name is Jasdev Singh and i have 10 years of experience of BPO. In this field i have 5 years of experience in SAP end user profile and rest 5 years of Banking. I have already done the SAP FICO course from some local institute, however not able to find the job. Hi I’m a BSc accounting and finance graduate. I want to take the SAP FICO certificate exams, please could you suggest a most recent published book for this course. I am planning to do self study. i have done MBA in Marketing and HR and i have 2yr of experience as Payroll Executive.i wanted to do SAP course but i dont have any idea about this plz let me know which course will be suitable for me and from where i should do? I have been working as a recruiter for the last two years. Now, i’m planning to learn an ERP, so first of all I’m confused which ERP should I go, either SAP or Oracle. Second thing , which module should be good for me, as I’ve 2 years in recruitment, so willing to start in HR/HCM module. let me know your thoughts please.. Thanks in advance. I have 6years of experience in inside sales in different implementation partner company. i want a course in SAP my qualification is +2 only. you did not mention the last generation SAP trainings with simulators. I know only 2 companies producing such trainings: Aasken (Sweden) and Michael managenet (US). Thank you for the comment! But unfortunately these companies don’t offer free SAP training… Please correct me if I am wrong. It’s Very helpful for me know about the SAP . or it is just fake? As a middleclass men, it is not possible to pay 3.35lakhs for courses in reputed coaching centers. i have 2 years of experience in Accounts payable as a SAP end user. i am really willing to learn the SAP and to be as a consultant. Hi,I am Umashankar..Presently iam working in an automobile sector as an vendor development-materials….what is the basic module in sap??? Where do I learn it for free?? ?how it can be helpful for my upcoming career????? Plse help with free training on sap fico using dummy software, which sites have these resources, once mastered then can approach accredited sap partners for certification. I am doing job as a PPC Engineer in automobile company in manesar(gurgaon). I have 2.4 year experience. Can SAP learning improvize me to getting a new job with gud sallary package. And if yes then what type of certification I have to learn and from where? I have 10 yrs experience in Investment Banking, and now I am willing to go for SAP FICO SO Just wana know will my experience will be considered if yes then rite now I am at senior Manager designation so after SAP what designation I can expect? N will it be a ride decision foe me.? I agree , the Academies of SAP are very expensive. My personal experience was to buy affordable courses and renting access to sandbox IDES platform where I could practice. I learned enough to had a very good job interview and I could go to work as jr consultant. The salary was pretty good and I could finally pay for certification. Nowadays I am sr consultant and finally I could increase my income. I DONE MY BTECH IN ECE AND NOW I WANT TO LEARN SAP.I AM IN GERMANY PLEASE HELP ME TO SUGGEST WAY TO LEARN SAP. Mail me Rekha i will let you know the institutes available near your place. I want to do SAP course but don’t know whom about that a good institute in Delhi. 2. What modules shall I follow in cornic order. Hi, I need sap hana cloud integration course training and practice purpose system also. Is it possible to provide to me. hi, i am 29 years Post graduate in Supply chain management with Japanese language skills (business level). I have worked with manufacturing units as a language support staff over 5 years. Though, i have switched to export & freight forwarding industry since last couple of year. shall i join SAP training. If yes, than what module. how my bilingual skills can help me to find a good job. Now i am a graduate student and i heard about SAP so can you please tell me that is it a right decision for me or not and if i do SAP course so what is the best institute for me? And in which sector i should do it…please tell me I am so worried. If you aregood with programming, you can choose SAP Technical Modules like ABAP to start up a fine career in SAP. Hii , i have recently done my sen. Sec. Education in commerce and i want to do SAP , so please recommend me , which graduation course is suitable for me and would help in future for SAP course. I have a doubt regarding SAP COURSES..Does we have to study codes or developing codes if we learn SAP..? SAP has Functional & Technical (Coding/Programming) Modules..
Am currently working as Manager Accounts with 27 years experience. basically i want to learn the SAP. Pls help me in this regard. My basic qualification is B.Com, MBA Finance. Hi. I am here in Canada Vancouver and I am looking for a course about SAP and I can’t find it. Could you help me. I need to study this course so fast, because if I wanna a good job in Brazil I need to know. I am currently a Warehouse Supervisor and have 5 years experience, we are already on SAP at work but I would like to be certified in SAP and my company won’t pay for it. Will the open SAP certificate be relevant on my cv at this stage? Hello trying to learn SAP in a supply chain / Project management environment. I see alot of different programs and training. Can.you direct me to where I can learn for free. Hi I want to be a professional SAP engineer what course I need to do ? and how I cam learn it. Hello sir, my name is Raja and i am a graduate. I have worked as key punch operator on IBM 56 (card punch) and on IBM 3742 (dual data station) and now i want to learn how to work on SAP, because if i apply for a job in a warehouse they ask me first thing about SAP. and i dont know how to work on SAP and how to operate it. Would you please guide me in this regard. Thanks. Hello I m a btech graduate with more than 5 yrs of experience in various fields like oil and gas industries, project industries, automation and electronic industries etc.but now I want to switch over to software and want to do SAP. Can you suggest me which module will best suits me. I think that you get started here: What is SAP. Hi! I recommend you to post your question at our SAP forum. This is the only way to get a good answer for sure. Good evening! Could you answer my question? Some people say that SAP B1 B2…… so many types of SAP? What are they different? This is yashwanth from India. Am pursuing MBA 1st year. I had completed Tally Erp and currently waiting for learning SAP FICO. Can you please give me any suggestions about job after completion of my Mba based on this. Hi! Please post questions like this on the forum. I will answer them there. I am a BTEC (ECE) student I want to take a free certificate training course from SAP. Pl contact me how i take it. Myself Sagar singh , 19 years old. I had done Polytechnic diploma in Electronics engg. and looking For a degree now. Please consult me which degree is useful for me to learn and which can also help me in learning SAP . Please tell me Can i start SAP training now or after Degree . I have Some knowledge in Computer but not in software And I am working on PP module In a company for 1 year. help me sir what to do ? i am pooja shrivastava i have completed my mba in hr and bba in hr and have experiance of 2 year in hr.i want to do the sap training with my job.so please provide me the gudiline if possible to do sap training in hr moudule.with my continuation of job then. Hello ..Sir ..I’ve completed my bachelors in Mechanical Engineering stream and I’m intrested to learn SAP MM module and dont have much knowledge in programming . can you suggest me the how to approach this module and its carrier opportunities. Perhaps, you can start with our free SAP MM course? I am working in BPO sector now for 9 years. Want to come out of it. Age is 43. Salary take home is 26000/- p.m..
My name is Shalana I have always been in a finance field , SAP seems to be in every career field right now and I want to learn it as I as unemployed . How can I learn this quickly ? I interested to learn Sap geo.e or sap refx can u suggest which module it is cover because i am related to geographical. i am reading your article and it is interesting, but is there is any way to learn SAP through the internet website or so something simple .. I did my under graduate in Maths, having 2yrs of exp in SCM, by the way i’m using only few transactions in BP. do you have any idea if i learn SAP MM & SAP BP owe me a good opportunity to move on in Supply Chain Management. I would like to be a SAP Specialist but don’t know what some of the requirements are needed to become one and the duration for the studies. I have come across this blog, and it is very useful. It is a good initiative. I would like to know how i can do the SAP Success factor training for free as i’m interested to change my domain. I am Shiv Dhari from India.I completed B.Com currently waiting for learning SAP. Please, better suggestions for SAP course. 2) Where should I start? 3) Even though I have a much knowledge about SAP, will the companies hire me without any valid certificates? Thank you for Sharing this valuable information. It’s very important for those who want to learn SAP.I have completed automation training from Bangalore through Seleniumlabs. But I want to do SAP training is it right for me? I know SAP system but not deeply. I need to learn more about SAP. I am working in Mahle Behr company in Pune at finance dept. I know SAP system but not deeply. I need to learn more about SAP. I am working in Spicer india pvt .Ltd. company in Pantnagar at Production dept. In my new job I will have to use SAP for accounting, bookkeeping, balancing accounts, budgeting, controlling, invoicing, year-end financial statements, etc. I would like to prepare for this hurdle as best I can, and I have no knowledge of SAP what so ever. Can you please recommend where and with what to beginn? Where can I find some kind of relevant information about how SAP works in this area? Thank you so much in advance. is this website is only for SAP beginners?or am i misunderstanding?. I am looking for SAP certification ,But It looks too expensive here in India. I have enquired some SAP official training institute about fees its around 6000 $. Hi Sir,I Mayuri Patil completed my engineering in E&TC Branch .after that I have 4.6 yrs work experience in education field as lecturer.Now I Completed ME(Embedded & VLSI Systems)in the year 2016.My age is 31 yrs now.i want to change my profile .Which module is suit for me?Will I get job in Sap? I am 58 years old and have more than 30 years of experience in HR Operations. I am currently without job. Will I be able to get a job now if I learn SAP HR and be a functional consultant or a end user employee? Or is it too late? Can some one please advise? I appreciate with the things you shared here. This will guide the freshers who want to learn SAP & its modules for free & who can’t afford the fee for SAP learning. Hi I want to learn SAP . Joined as a fresher in Small scale industry and got basic training in SAP FI. Can anyone suggest me whether to go as functional consultant or technical consultant so that I can start learning further. Can I know where are you located? Hi, am 33 years old. I am in php for 3 years, 5 years as professor, is it good for me to learn SAP. i am working as a storage infrastructure engineer for past 5 years and having a prior experience of System Administration , i am in the age of forty, will it be fair to get an opportunity to survive in SAP. I have absolutely no knowledge of SAP HR and am considering self-teaching it, do you think its possible to gain all of the necessary knowledge by self-teaching and do you think its possible to learn SAP HR part-time? If so, how long roughly do you think it would take? Previous Previous post: SAP FICO Fresher Jobs – Myth or Reality?